Next year is most likely going to be the year of the Android phone – the time for it to take centre stage with offerings from Motorola, Asus and hopefully a few others. But it seems Nokia won’t be joining the party. Nokia won’t even be standing outside in the cold with its face pressed up on the glass, fogging up the window with its breath, hoping someone will say “Hey Nokia, come and join the party”. No, Nokia wants nothing to do with the new OS, dismissing adopting Android and admitting Linux could take centre stage on high-end handsets in the future. Speaking in an interview, Nokia’s vice president had this to say: “I don’t see anything in Android which would make it better than Linux maem” (meow). “In the longer perspective, Linux will become a serious alternative for our high-end phones”. So that’s that then. 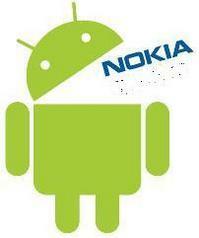 Don’t expect Nokia to bring us anything Android next year – it’s clear Nokia is *not* taking part in the Android race.